Photo: Paul Ellis/ AFP/ Getty Images. Brexit could trigger a huge sell-off in the pound, sending the currency down by as much as 11% against a basket of the world’s most important currencies, according to new research from Goldman Sachs released late on Wednesday. Goldman analysts Silvia Ardagna, Robin Brooks, and Michael Cahill argue that a so-called “Lehman-type” scenario — where uncertainty in the markets increases as much as it did following the collapse of the investment bank Lehman Brothers in 2008 — would cause a huge crash in the pound sending it down to levels not seen in decades. If there is a vote to leave the EU and uncertainty increases as much as it did after the Lehman collapse, we estimate that Sterling could weaken by about 11% in trade-weighted terms versus a basket of major DM currencies. In response to the same shock, the Euro could depreciate by around 4%, while the Yen could appreciate by about 14%, the Swiss Franc by 8% and the Norwegian Krone by 3%. Exchange rates would move much less if the shock were comparable to that which occurred in September 1992, when Sterling came under pressure and the UK government was forced to withdraw the currency from the European Exchange Rate Mechanism (ERM). 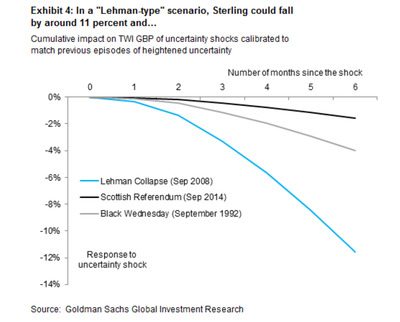 It should be noted that since February, Goldman has actually decreased its expectations for how far sterling could fall. 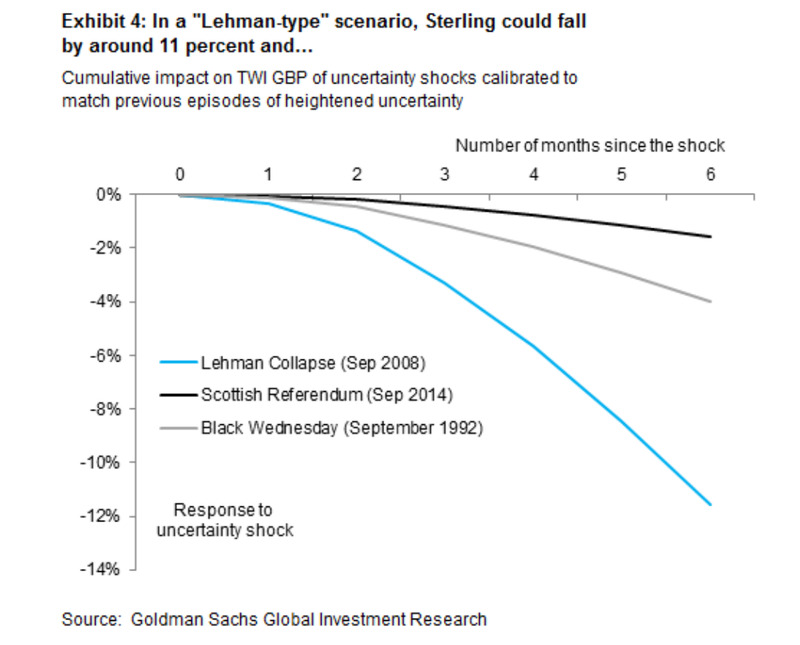 In February, bank analysts suggested a fall of 15-20% would be likely. Ahead of the referendum, the pound has been incredibly sensitive, frequently seeing big gains and falls, causing volatility to soar. On Monday, the pound’s volatility against the euro soared to historic levels, reaching 26%, more than the previous all-time high of around 25% reached during the global financial crisis. The BPVIX – a key tracker of sterling volatility – has been surging in recent months as traders have become increasingly jittery about the result of the referendum. It has more than tripled since January. Sterling has been particularly sensitive in recent weeks, frequently moving by 1% or more (a substantial move for a currency) after the release of polling data about voting intentions ahead of the referendum. For instance, the pound has slumped on Monday after polls over the weekend showed the Leave campaign in pole position ahead of next week’s vote. As a result of these moves, the VIX has jumped massively.